Custom K9 Sports T-shirts and More!!! Make a request! sets you have tried and the training points of each. 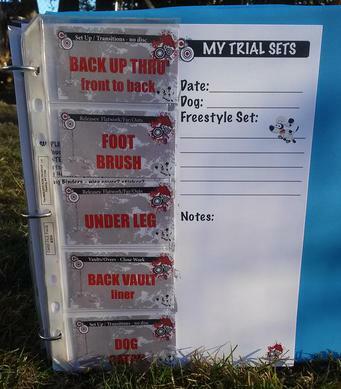 • Finished sets can be logged and put into play, with several live sets ready you have a freestyle routine! If the random set works - keep it! and reshuffle those cards back in. 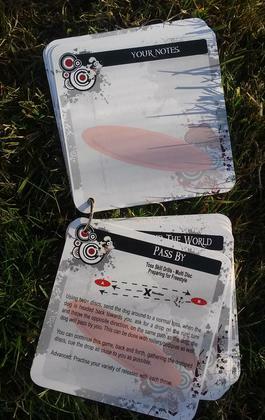 DISC DOG 101 Lesson Cards are a novice introduction to the Disc Dog Sport. Content is similar to the training tips found on the training page. 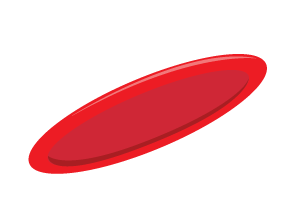 Printed on a heavy card stock and bound with a metal ring, they are great to take with you to the park! Notes section on the back side of cards. 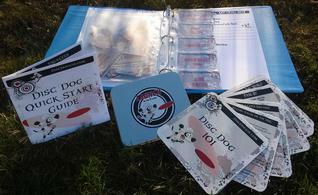 DISC DOG 101 Lesson Cards are great instructors tool. Use as a lesson plan, send your students home with Lesson and notes to work on during the week. I have been training and competing in Disc Dogs for over ten years, in that time the sport had grown and evolved. Its all very exciting! These products I created for my own use as I did not see a product on the market, so I created them to fill the lack of a training companion. Disc Dog 101 training companions. *I have a pile of note cards and scrap papers from the years of routine building...also found taking them to the yard to try a bit difficult, so the notebook is my solution.....Enjoy!